This Tuesday you are invited to Normal, Illinois for the Farm Assets Conference. I’ve seen parts of the presentations that will be made and fully expect this to be an impactful event. The tickets are $40. Our doors open at 9:30am at the Marriott Hotel and Conference Center. If you arrive by 8am the Illinois Corn Growers Association will provide you with breakfast and you may attend their annual meeting prior to the Farm Assets Conference. I’ve been traveling the last couple of weeks and thought you might find these three articles from the farmdocDaily website interesting. With planning for next year’s crop underway, this article makes suggestions related to financial and risk management for grain farms. Projections for extremely low income in 2019 set the overall backdrop for these decisions. Suggestions include: 1) building working capital in 2018, 2) forgoing investments in capital items, 3) conducting 2018 tax planning, 4) preparing 2019 cash flows, 5) beginning marketing the 2019 crop, 6) discussing the economic situation with landowners, and 7) considering acreage allocations for 2019. Currently, the most significant factor impacting longer-run income outlook on Midwest grain farms is the trade dispute with China. Events associated with this dispute caused large declines in cash and futures prices for both corn and soybeans (see farmdoc daily, October 11, 2018). Cash corn prices fell from near $3.70 in March to $3.20 in October. Cash soybean price fell from near $10 in March to near $8 in October. Soybean price declines lower expectations for 2019 net incomes on farms, particularly if the trade dispute continues. Current corn and soybean prices, along with cost increases, suggest extremely low returns for 2019 (farmdoc daily, August 7, 2018). While there are a number of events that could change this outlook (farmdoc daily, October 30, 2018), planning for low 2019 incomes seems prudent. Market Facilitation Program (MFP) payments (see farmdoc daily, August 28, 2018). Farmers will receive MFP payments for crops produced in 2018. Currently, farmers can receive a “first” payment of $.005 per bushel for corn and $.825 per bushel for soybeans. There is a high chance of a second payments on 2018 production at the same level as the first payments. If both payments are made, MFP payments could add about $50 of income per tillable acre on a typical Illinois farm. Exceptional yields (see farmdoc daily, September 5, 2018). State-wide yields are projected by the National Agricultural Statistical Service (NASS) at record levels for 2018. Many farms had exceptional yields. Pre-harvest hedging. Many farmers priced grain in the spring prior to the decline in prices (see farmdoc daily, October 11, 2018). Hedging will postpone the impacts of lower prices on income into 2019. While average incomes will be above-average in 2018, a great deal of variability in incomes will exist. Prices farmers receive will vary based on timing of pricing decisions. There are some areas that did not have exceptional yields and some farmers did not price much of the 2018 crop in the spring. The farmers in these situations will face lower income. Build working capital: The above-average incomes in 2018 should be saved and used to build working capital. Any increase in working capital at the end of 2018 will be useful in offsetting low and negative 2019 incomes. If possible, obtaining a current ratio of 2.0 and having working capital per acre of over $300 per acre seems prudent (see farmdoc daily, October 23, 2018). Forgo investments in capital items: Building working capital requires eliminating all but the most necessary capital investments. Conduct 2019 tax planning: Above-average 2018 incomes and low capital investments could result in large 2018 tax liabilities. Most farmers file taxes on a cash basis. A potential way to lower 2018 tax liabilities is to shift 2018 revenue into 2019 by foregoing sales of crop and by delaying the receipt of MFP payments until 2019. Prepaying 2019 expenses in 2018 could also lower 2018 tax liability. Shifting more than a usual amount of 2018 tax income into 2019 has a downside in that 2019 taxable incomes could be higher than expected. The outlook for significantly lower incomes in 2019 is due to yields at trend levels, lower prices, and higher costs. If this turns out not to be the case, 2019 tax liabilities could be larger than expected (see farmdoc daily, October 30, 2018, for a discussion of items that could change 2019 outlook). Prepare a 2019 cash flow: Cash flows for 2019 operating year should be prepared. In preparing these cash flows, use cash bids for fall delivery prices and higher costs (see Revenue and Costs for Illinois Crops, for estimates of cost increases). Current prices for 2019 fall delivery are near $3.70 per bushel for corn and $8.90 per bushel for soybeans. Five-year average yields, and Approved yields from crop insurance records (the yields that have been trend adjusted). Plans should be made on how to deal with the resulting cash flow from only obtaining the APH approved yields. If enough working capital exists, operating notes can be maintained at current levels. Otherwise, contingency plans that may involve refinancing debt and selling assets need to be considered. Begin marketing the 2019 crop: Futures prices on Chicago Mercantile Exchange (CME) contracts for fall delivery are near $4.00 per bushel for corn (December contract) and $9.35 per bushel for soybeans (November 2018). Current basis between fall futures contracts and cash delivery prices is large. Current cash prices for fall delivery are near $3.70 for corn and $8.90 for soybeans. Pricing some of the 2019 crop should begin: Current CME futures prices on the December 2019 contract can be compared to projected prices for crop insurance in recent years. These projected prices are based on settlement prices of December contracts and are comparable to the December 2019 CME price. For corn, current futures prices are near levels that have occurred in recent years. A $4.00 future price for 2019 would be slightly above recent projected prices: $3.86 in 2017, $3.97 for 2017, and $3.96 for 2018. Over the past five years, the projected price averaged $4.11 per bushel. Pricing soybeans at levels below those in recent years may be physiologically difficult. Many farmers have a hope that the trade dispute with China will end and soybean prices will rebound. This is a real possibility. However, there are possibilities were soybean prices could be lower. One scenario which will result in lower prices is a continuation of the 25% tariff on U.S. soybeans moving into China, good yields in South America, and another excellent yielding year in the United States. There are significant down-side price risks for soybeans, suggesting that a modest level of pricing grain may be prudent. Discuss the economic situation with landowner: The trade dispute with China has considerably darkened the price outlook for the future. Farmers may have built soybean prices in the high $9 range into longer-run budgets. Until a resolution to the trade dispute occurs, building soybean price expectations around $9 per bushels seems prudent (see farmdoc daily, August 2, 2018 for more of a discussion). Consider 2019 allocations to corn and soybeans: Budgets for 2019 likely will indicate that corn will be more profitable than soybeans in 2019. This may not suggest shifting acres, particularly for those farms that have a well-established rotation. If switching is being considered, hedging more than a usual amount of corn production may be warranted. If there are large shifts from corn to soybeans, corn prices could decrease. Summary The above management responses are defensive and are built on an expectation of longer-run lower prices caused by a continuing trade disputes with China. In addition, cost increases play a role in the management suggestions. Obviously, expectation of low incomes can turn out to be incorrect for a variety of reasons. Still, conserving cash flow now seems to have little downside for most farmers if 2019 incomes turn out to be better than expected. After more than a year of talks, the US, Canada, and Mexico struck a new trade deal to replace NAFTA, known as the United States-Mexico-Canada Agreement, or USMCA. The agreement is still waiting for approval in Congress. After the Democrats took control of the House in the midterms last week, that approval is now in question. Regarded as “the most important trade deal we’ve ever made” by President Trump, the USMCA is the replacement of the old NAFTA deal, which he described as “the worst trade deal maybe ever signed anywhere” (Brinkley, Oct 8, 2018). Since NAFTA was signed more than 25 years ago, there are some updates to the agreement that are arguably needed. The way countries trade with each other has transformed significantly since then. New components of trade, including digital commerce, should be addressed in the regional trade deals. However, most of the old agreement remains intact. The new NAFTA doesn’t change the old tariff structure or the zero tariffs policy on most manufacturing and agricultural goods. There are large sections of the old NAFTA which were not touched. The most significant changes, including digital trade, were previously negotiated as part of the Trans-Pacific Partnership, from which the current administration withdrew in 2016 (Pethokoukis, Oct 17, 2018). This article reviews the changes in USMCA and evaluates its impacts on the various parties associated with the trade agreement. Overview of changes The first change in the country of origin rules: automobiles must have 75 percent of their components manufactured in Mexico, the US, or Canada to qualify for zero tariffs (USTR, Oct 1, 2018). It used to be 62.5 percent under NAFTA. The increased portion means that fewer cars or car components will come from suppliers elsewhere in the world. Consequently, it would impact car parts made in countries like Germany, Japan, and China. Shifting supply lines can take decades and, along with increased costs based on lack of infrastructure, consumers end up paying more (Pethokoukis and Barfield, Oct 17, 2018). The second change is on labor provision or minimum wage. Forty to forty-five percent of automobile parts have to be made by workers whose pay averages at least $16 an hour by 2023 (USTR, Oct 1, 2018). Mexico has also agreed to pass laws giving workers the right to union representation, extend labor protections to migrant workers, and protect women from discrimination. The countries can also sanction one another for labor violations. These rules demonstrate a key U.S. ambition to benefit American workers through rebalancing the manufacturing sector (Wingrove et al., Oct. 2, 2018). The minimum wage will not bind in Canada and U.S., but it is about three times the current typical manufacturing wage in Mexico (Long, Oct. 1, 2018). Considering that the change doesn’t happen until 2023 and with possible inflation involved in the process, the effect on Mexico’s workers may not be as significant as it seems. More automation may be the substitute for workers as a result. This is a novel effort to set a minimum wage in a specific sector through a trade agreement. Usually, minimum wages require a domestic process and, in the US, often at the state level. It is unclear what precedent having minimum wages imposed by a trade agreement sets for future labor or trade law (Pethokoukis and Barfield, Oct 17, 2018). The third big issue is the dairy market. To get an agreement, Canada agreed to open a small portion (3.59 percent) of its dairy market to farmers in the United States (Wingrove et al., Oct. 2, 2018). This concession follows similar concessions to the EU (Comprehensive Economic and Trade Agreement or CETA) and pacific country trade partners under the Comprehensive and Progressive Trans-Pacific Partnership (CPTPP), the successor to the Trans-Pacific Partnership trade agreement, which cumulatively means that Canada has opened up about 10 percent of its dairy market (CBC News, Oct 04, 2018). Also, as part of the deal, Canada will give up its unique pricing system of Class 7 milk that sets unusually low domestic prices of ultra-filtered milk (an ingredient used to increase protein content in cheese and yogurt) (Skerritt et al., Oct. 2, 2018). By allowing for low prices of this ingredient, the Canadian policy effectively subsidized Canadian dairy processors and made the imports of ultra-filtered milk uncompetitive (Wingrove et al., Oct. 2, 2018). Canada’s concessions will boost the amount of milk, cheese, and cream that the U.S. can export without paying the tariff. As a result, Trudeau agreed to compensate the Canadian dairy farmers to soften the blow (CBC News, Oct 04, 2018). Considering the 500 billion dollars of annual trade flows going between these two countries, the dairy market is relatively small: in 2017, Canada imported around 368 million dollars of dairy products from the U.S. while exporting 112 million dollars (Skerritt et al., Oct. 2, 2018). President Trump, however, had insisted on changes to U.S. access to Canada’s dairy market as a symbolic gesture on behalf of American farmers. A significant new section in the new NAFTA is the digital trade section. When WTO and NAFTA were negotiated in the early 1990s, the internet was relatively new and far less critical. The digital trade section covers trade rules in the digital economy, including prohibiting duties on music and e-books, and protections for internet companies, so they’re not liable for content their users produce (Kirby, Oct 3, 2018). The deal also extends the terms of copyright to 70 years beyond the life of the author (up from 50). It also extends the protection period of pharmaceutical drugs from generic competition. Key Democratic Demands The current consensus is the USMCA will not be passed easily (Alemany, Nov. 15, 2018). Generally speaking, news reports indicate that Democrats are in favor of the changed labor requirements (Byrd H. Nov. 13, 2018), but remained concerned about the ability to enforce the deal. House Minority Leader Nancy Pelosi released a statement on USMCA saying without enforcement, the deal could just be rebranding NAFTA (Alemany, Nov. 15, 2018). Second, labor activists have demanded a change in the clause regarding minimum hourly wages for Mexican autoworkers since the current deal does not include an adjustment for inflation. They fear the that the $16 wage may not be enough to curb the movement of jobs flowing out of the U.S. (Wasson and Mayeda, Nov. 14, 2018). There are also concerns about the steel and aluminum tariffs, which remain in place for Canada and Mexico despite the new agreement (Byrd H. Nov. 13, 2018). Some of the newly elected Democrats in the House Representatives came from the Midwest, for example, “where the pain from the president’s tariffs is being felt the most” and they would be expected to push for the removal of the tariff in the USMCA debates (Alemany, Nov. 15, 2018). Summary In summary, there are significant updates to NAFTA in the automobile and dairy industry, but other changes are relatively minor. There is also little evidence that it will significantly alter trade balances among the three countries (Martin Feldstein, April 25, 2017). Although U.S. Trade Representative Lighthizer remains “very confident” in ultimately getting the votes needed to pass the USMCA, it appears unlikely to happen in a lame duck session; passage will be up to the new Congress where the concerns on the steel and aluminum tariff adds uncertainty. Subsurface tile drainage networks significantly underpin agriculture across the US Midwest with Illinois alone possessing nearly 10 million tiled acres. However, nitrogen that leaves Midwestern fields in tile drainage water can impair local water bodies used as drinking water sources and is known to contribute to the hypoxic zone (or, “dead zone”) that forms seasonally in the Gulf of Mexico. Growing global food and biofuel demand combined with increasing societal pressure for clean water mean the agricultural community must be offered workable solutions to meet productivity goals in ways that don’t result in nutrient-impaired waters. A variety of agricultural conservation practices are available to reduce the amount of nitrogen leaving fields and travelling downstream. The practices are generally grouped into three categories: management practices that can be done in-field, structural practices that can be built at the edge of a field, and land use changes (Table 1). While each individual practice is valuable, the nitrogen removal effectiveness will be site specific and the acceptability of each individual approach will differ between producers. No given conservation practice will be capable of addressing drainage water quality concerns in entirety; as such, a suite of approaches used across the landscape will be required. Each practice’s effectiveness for reducing nutrient loss in terms of a “percent effectiveness” can be compared. For nitrogen loss through tile drains, research shows that practices addressing the drainage system itself tend to be more focused and have relatively high practice efficiencies. For example, woodchip bioreactors and wetlands are rated at 25% and 50%, respectively, in the Illinois Nutrient Loss Reduction Strategy, meaning they keep one quarter and one half, respectively, of the nitrogen that would otherwise move downstream from doing so. The most effective practices for reducing nitrogen loss through tile drains tend to be land conversion practices which require switching production to perennials like pasture or bioenergy crops (90% N loss reduction). While Table 1 presents average values, nitrogen loss reduction effectiveness of any practice can vary by soil type, topography, landscape position, and weather. 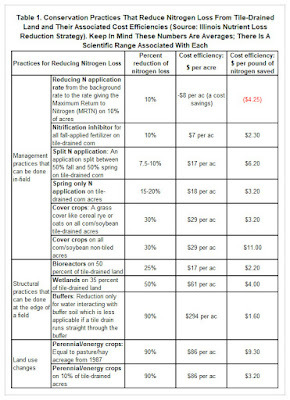 Another way to compare these practices is cost efficiency, both in terms of dollars per acre and dollars per pound of nitrogen that is being kept from moving downstream (Table 1). While the land use change practices are the most effective in terms of percent nitrogen loss reduced (90%), they do no tend to be some of the most cost effective practices. 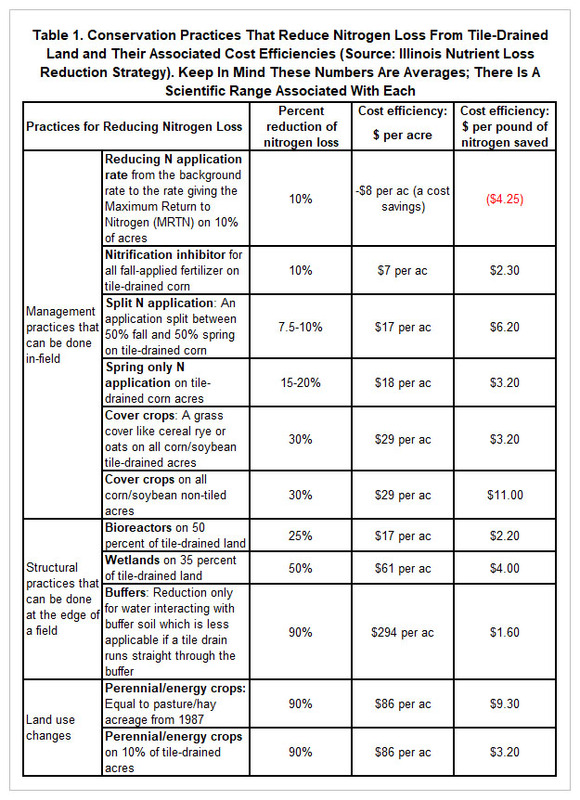 However, beyond the cost efficiencies listed in Table 1, it’s very important to note that some practices provide additional benefits beyond reducing nitrogen loss in tile drainage. For example, there is evidence that long-term use of certain cover crops can improve soil health, and constructed wetlands are known to provide pollinator habitat and can be of interest to hunters for providing wildlife habitat.